Kevin McSorley has waited a while to get out on the field and debut with the Irish Warriors at an International Cup. Originally selected as part of the Warrior’s squad for IC11, Kevin sustained an injury which ruled him out of making the trip. But tomorrow, his second chance arrives when the Irish Warriors take on the Fiji Tribe as stage one of the team’s quest to win back to back International Cup titles and win their third men’s title. When asked about the current Australian Rules environment back in Ireland he says it is “fairly healthy, but would love to see it grow further from youth level. 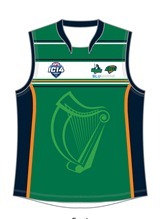 As Development Officer in Ireland I'm putting strategies in place to ensure this happens.” Certainly, if Kevin’s groundwork now can take root, Irish Australian Rules teams may continue to dominate for years to come. Let’s see if the luck of the Irish can hold, and that Kevin gets to enjoy his debut at this event.